In October 2010, the Air Force's Elmendorf Air Force Base and the Army's Fort Richardson combined to become one installation, in accordance with the Defense Department's 2005 Base Closure and Realignment Commission recommendations. This merger of two installations and two combat missions formalized an already close working relationship the Air Force and Army have shared here for years; working together under the Alaskan Command. Today, JBER continues to grow in importance to U.S. national security because of its strategic location and complimentary mix of military capabilities to include F-22 Raptors, Pacific Command's only airborne infantry brigade and C-17 Globemaster IIIs that get them to the fight. Elmendorf Air Force Base, adjacent to Anchorage, is the largest Air Force installation in Alaska and home of the Headquarters, Alaskan Command (ALCOM), Alaskan NORAD Region (ANR), Eleventh Air Force (11th AF) and the 3rd Wing. Construction on Elmendorf Field began on 8 June 1940, as a major and permanent military air field near Anchorage. The first Air Corps personnel arrived on 12 August 1940. On 12 November 1940, the War Department formally designated what had been popularly referred to as Elmendorf Field as Fort Richardson. The air facilities on the post were named Elmendorf Field in honor of Capt Hugh M. Elmendorf, killed in 1933 while flight testing an experimental fighter near Wright Field, Ohio. After World War II, the Army moved its operations to the new Fort Richardson and the Air Force assumed control of the original Fort Richardson and renamed it Elmendorf Air Force Base. Bismark Sea Battle. The first Air Force unit to be assigned to Alaska, the 18th Pursuit Squadron, arrived in February 1941. The 23d Air Base Group was assigned shortly afterwards to provide base support. Other Air Force units poured into Alaska as the Japanese threat developed into World War II. The 11th Air Force was formed at Elmendorf AFB in early 1942. The field played a vital role as the main air logistics center and staging area during the Aleutian Campaign and later air operations against the Kurile Islands. Following World War II, Elmendorf assumed an increasing role in the defense of North America as the uncertain wartime relations between the United States and the Soviet Union deteriorated into the Cold War. The 11th Air Force was redesignated as the Alaskan Air Command (AAC) on 18 December 1945. The Alaskan Command, established 1 January 1947, also headquartered at Elmendorf, was a unified command under the Joint Chiefs of Staff based on lessons learned during World War II when a lack of unity of command hampered operations to drive the Japanese from the western Aleutian Islands of Attu and Kiska. The uncertain world situation in late 1940s and early 1950s caused a major buildup of air defense forces in Alaska. The propeller-driven F-5ls were replaced with F-80 jets, which in turn were replaced in succession by F-94s, F-89s, and F-102s interceptor aircraft for defense of North America. The Air Force built an extensive aircraft control and warning radar system with sites located throughout Alaska's interior and coastal regions. Additionally, the Air Force of necessity built the White Alice Communications System (with numerous support facilities around the state) to provide reliable communications to these far-flung, isolated, and often rugged locales. The Alaskan NORAD Regional Operations Control Center (ROCC) at Elmendorf served as the nerve center for all air defense operations in Alaska. Air defense forces reached their zenith in 1957 with almost 200 fighter aircraft assigned to six fighter interceptor squadrons located at Elmendorf AFB and Ladd AFB. Eighteen aircraft control and warning radar sites controlled their operations. Elmendorf earned the motto "Top Cover for North America." AAC adopted the motto as its own in 1969. The late 1950s, 1960s, and early 1970s brought about a gradual, but significant decline in air defense forces in Alaska due to mission changes and the demands of the Vietnam War. The Air Force inactivated five fighter squadrons and closed five radar sites. In 1961, the Department of Defense consigned Ladd AFB to the Army which renamed it Fort Wainwright. The Alaskan Command was disestablished in 1975. Elmendorf began providing more support to other Air Force commands, particularly Military Airlift Command C-5 and C-141 flights to and from the Far East. Despite a diminished number of personnel and aircraft, a turning point in Elmendorf's history occurred in 1970 with the arrival of the 43d Tactical Fighter Squadron in June 1970 from MacDill AFB, Florida. The squadron gave AAC an air-to-ground capability which was further enhanced with the activation of the 18th Tactical Fighter Squadron at Elmendorf (also with F-4Es) on 1 October 1977. The strategic importance of Elmendorf AFB was graphically realized during the spring of 1980 when the 18th Tactical Fighter Squadron deployed eight of its F-4Es to Korea to participate in exercise Team Spirit. It was a historical first and underlined an increasing emphasis AAC placed on its tactical role. The strategic location of Elmendorf AFB and Alaska made it an excellent deployment center, a fact that validated the contention of Billy Mitchell who, in 1935, stated that "Alaska is the most strategic place in the world." Deployments from Elmendorf AFB and Eielson AFB to the Far East are now conducted on a routine basis. The 1980s witnessed a period of growth and modernization of Elmendorf AFB. During l982, the 21st Tactical Fighter Wing converted from F-4s to F-15s. The 18th Tactical Fighter Squadron was assigned to Eielson AFB where it was equipped with A-10s. The 54th Tactical Fighter Squadron, of Aleutian Campaign fame, activated once again in 1987. Rounding out the modernization program was the construction of an enhanced Regional Operations Control Center (completed in 1983), and the replacement of the l950s generation aircraft control and warning radars with the state of the art AN/FPS-117 Minimally Attended Radars. The integrated air warning and defense system became fully operational in mid 1985. Alaska's air defense force was further enhanced with the assignment of two E-3As to Elmendorf AFB in 1986. 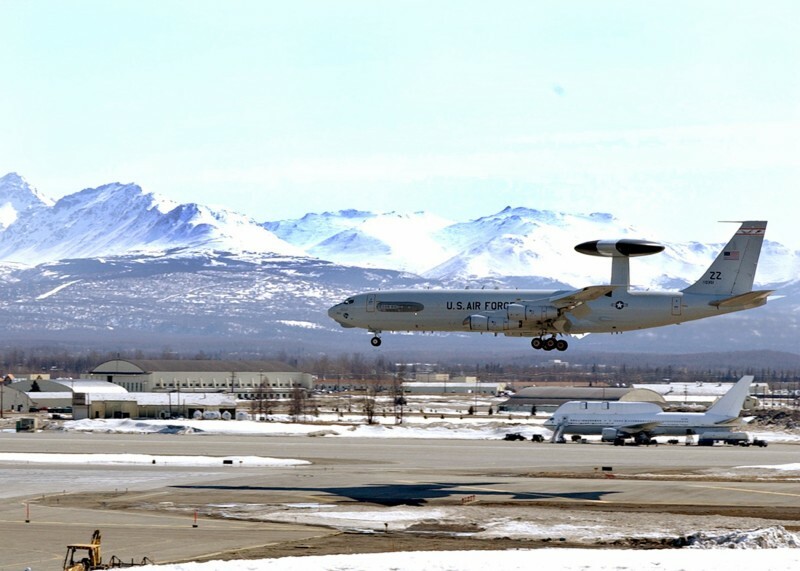 The Alaskan Command was reestablished at Elmendorf in 1989 as subunified joint service command under the Pacific Command in recognition of Alaska's military importance in the Pacific region. That importance was further recognized when the F-15E Strike Eagle equipped 90th Tactical Fighter was reassigned to Elmendorf Air Force Base from Clark Air Base in the Philippines in May 1991. The Pacific Regional Medical Center moved from Clark to Elmendorf and construction of a new, greatly expanded hospital began in 1993. The early 1990s also saw major organizational changes and an expansion of Elmendorf's importance. In 1991, the 21st Tactical Fighter Wing was reorganized as an objective wing and all the major tenant units on Elmendorf were placed under it. The 21st Wing inactivated and the 3rd Wing was reassigned from Clark Air Base to Elmendorf Air Force Base on 19 December 1991. This was in keeping Air Force's polices of retaining the oldest and most illustrious units during a period of major force reductions. The Air Force, because of the increased size and complexity of the 3rd Wing, assigned a general officer as its commander in July 1993. Today, Elmendorf AFB continues to grow in size and importance because of its strategic location and training facilities. The expansive Cope Thunder exercises, formerly conducted in the Phillippines moved to ranges near Eielson AFB, and Elmendorf regularly hosts visiting wings as well as participates in the exercises. A new regional composite medical facility is nearing completion and there are many pending construction projects which will make Elmendorf AFB the center of strategic planning in the North Pacific for the foreseeable future. Secretary of Defense Recommendations: In its 2005 BRAC Recommendations, DoD recommended to close Kulis Air Guard Station (AGS), AK, and relocate the 176th Wing (ANG) and associated aircraft (eight C-130Hs, three HC-130Ns, and five HH-60s) and Expeditionary Combat Support (ECS) to Elmendorf Air Force Base, AK. It also recommended to realign Elmendorf Air Force Base. With the addition of four aircraft from another installation (see Air Force recommendation for Ellsworth Air Force Base and Dyess Air Force Base), the 176th Wing at Elmendorf would form an ANG/active duty association with 12 C-130H aircraft. The 3d Wing at Elmendorf Air Force Base would distribute 24 of 42 assigned F-15C/D aircraft to the 1st Fighter Wing, Langley Air Force Base, VA.
DoD also recommended to realign Elmendorf Air Force Base. The 366th Fighter Wing, Mountain Home Air Force Base, ID, would receive F-15E aircraft from the 3d Wing, Elmendorf Air Force Base, AK (18 aircraft), and attrition reserve (three aircraft). Military value was the predominant consideration in moving the F-15Es from Elmendorf (36) to Mountain Home (23) and F-16s to Nellis (12) and McEntire (48). This recommendation would realign Mountain Home to fly only F-15Es, streamlining operations at a location that would be well suited for air-to-ground, low-level and air-to-air flight training. Assuming no economic recovery, this recommendation could result in a maximum potential decrease of 1,388 jobs (802 direct jobs and 586 indirect jobs) over the 2006-2011 period in the Anchorage, AK, Metropolitan Statistical economic area (0.7 percent). DoD also recommended to realign Dyess AFB, TX. The C-130 aircraft assigned to the 317th Airlift Group would be distributed to the 176th Wing (ANG), Elmendorf AFB, AK (four aircraft) and 2 other installations. Elmendorf Air Force Base would have an active duty/Air National Guard association in the C-130 mission. The C-130s would be distributed to Elmendorf (51-airlift) to facilitate active duty associations with the Guard and Reserve units. In another recommendation, DoD would realign Fort Richardson, AK, by relocating the installation management functions to Elmendorf AFB, AK, establishing Joint Base Elmendorf-Richardson, AK. All installations employed military, civilian, and contractor personnel to perform common functions in support of installation facilities and personnel. All installations executed these functions using similar or near similar processes. Because these installations shared a common boundary with minimal distance between the major facilities or are in near proximity, there was significant opportunity to reduce duplication of efforts with resulting reduction of overall manpower and facilities requirements capable of generating savings, which would be realized by paring unnecessary management personnel and achieving greater efficiencies through economies of scale. Intangible savings would be expected to result from opportunities to consolidate and optimize existing and future service contract requirements. Additional opportunities for savings would also be expected to result from establishment of a single space management authority capable of generating greater overall utilization of facilities and infrastructure. Further savings would be expected to result from opportunities to reduce and correctly size both owned and contracted commercial fleets of base support vehicles and equipment consistent with the size of the combined facilities and supported populations. Regional efficiencies achieved as a result of Service regionalization of installation management would provide additional opportunities for overall savings as the designated installations are consolidated under regional management structures. The quantitative military value score validated by military judgment was the primary basis for determining which installation was designated as the receiving location. Assuming no economic recovery, this recommendation could result in a maximum potential reduction of 412 jobs (224 direct jobs and 188 indirect jobs) over the 2006-2011 period in the Anchorage, AK Metropolitan Statistical Area economic area (0.2 percent). Secretary of Defense Justification: These first two recommendations distribute C-130, HC-130 and HH-60 aircraft from Kulis AGS (110) to Elmendorf Air Force Base (51), which has a higher military value. Moving these aircraft to Elmendorf Air Force Base consolidates two installations in the same city, reduces infrastructure, creates an active/ARC association, and retains the skilled, highly trained ANG personnel from Kulis AGS. This recommendation also distributes a portion of the F-15C/Ds at Elmendorf Air Force Base (36-fighter) to Langley Air Force Base (2-fighter). Elmendorf retains one squadron (18 aircraft) for air sovereignty missions and distributes the remaining 24 F-15Cs to Langley Air Force Base. The fourth recommendation consolidates the B-1 fleet at one installation to achieve operational efficiencies. Ellsworth (39) ranked lower in military value for the bomber mission than Dyess (20). To create an efficient, single-mission operation at Dyess, the Air Force realigned the tenant C-130s from Dyess to other Air Force installations. The majority of these aircraft went toLittle Rock (17-airlift), which enables consolidation of the active-duty C-130 fleet into one stateside location at Little Rock, and strengthens the Air National Guard squadron to facilitate an active duty association with the Guard unit. The other C- 130s at Dyess were distributed to Elmendorf (51-airlift) and Peterson (30-airlift) to facilitate active duty associations with the Guard and Reserve units at these installations. Community Concerns: Alaskan community representatives argued DoD underestimated the costs of the move, citing a recent Air Force site survey estimating the relocation would require more than initially estimated. 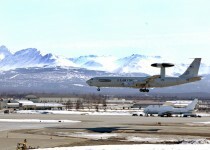 While acknowledging the move would benefit development of Anchorage International Airport, the community notes Air Guard operations would suffer if the move is underfunded. The Governor stated that his consent to the proposed relocation would be contingent on adequate funding. Commission Findings: The Commission found that the relocation of the C-130s and helicopters from Kulis to Elmendorf, while consistent with the BRAC selection criteria, would be considerably more expensive than originally estimated. The Commission notes that the Governor of Alaska as well as its Adjutant General supports the relocation of Kulis AGS to Elmendorf, if properly funded. If significantly under-funded, the commission is concerned that the readiness of the Air National Guard unit could be negatively impacted. Therefore, the Commission supports the DoD recommendation to move the ANG C-130 and HH- 60 on Kulis AGS, contingent on the availability of adequate military construction funds to provide the necessary facilities at Elmendorf AFB. The Commission identified no impediments to the proposed realignment of Elmendorf AFB, and relocation of some of its F-15 aircraft to Langley AFB, VA. Elmendorf is scheduled to receive F/A-22 aircraft outside of the BRAC process. The F-15s that remain at Elmendorf would continue to conduct the air sovereignty and other mission in Alaska. Because of changes in other recommendations, the full complement of C-130s may have to come from elsewhere than locations noted in the original recommendation. Contingent on the availability of adequate military construction funds to provide the necessary facilities at Elmendorf AFB, AK, close Kulis Air Guard Station (AGS), AK. Relocate the 176th Wing (ANG) and associated aircraft (eight C-130Hs, three HC-130Ns, and five HH-60s) and Expeditionary Combat Support (ECS) to Elmendorf Air Force Base, AK. Realign Elmendorf Air Force Base. The 176th Wing at Elmendorf will form an ANG/active duty association with 12 C- 130H aircraft. The Commission recommends 3d Wing at Elmendorf Air Force Base will distribute 18 of 42 assigned F-15C/D aircraft to the 1st Fighter Wing, Langley Air Force Base, VA and 6 to an Air National Guard unit. The Commission found that this change and the first two recommendations as amended are consistent with the final selection criteria and the Force Structure Plan. The full text of this and all Commission recommendations can be found in Appendix Q. However, the Commission found that the Secretary of Defense deviated substantially from final selection criteria 1, 2, 3, 5 and 6, and the Force Structure Plan. Therefore, the Commission has rejected the fourth recommendation of the Secretary.